Teatru Astra has just announced its latest educational initiative, 'Behind the Opera Curtain', a free workshop featuring the artistic and music directors from Teatru Astra's forthcoming production of AIDA. 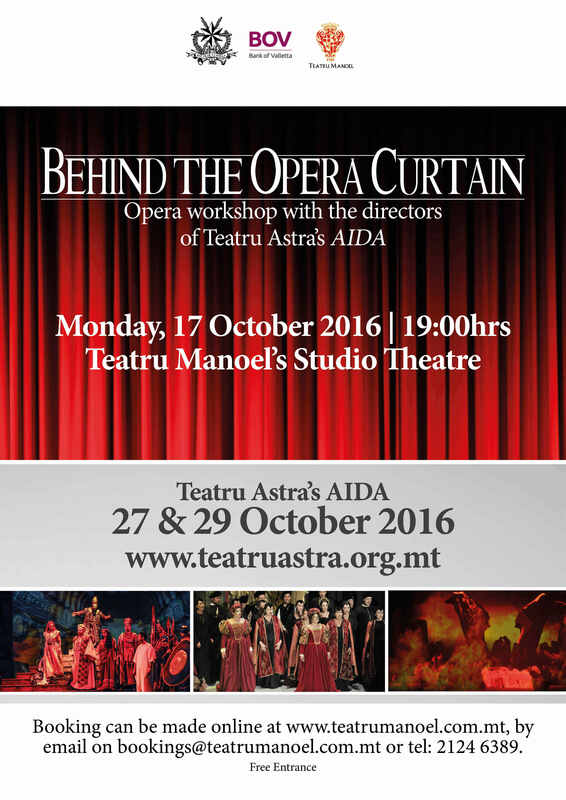 Aimed at opera lovers and patrons of the Astra residing in Malta, singers and students, the workshop will be held at the Teatru Manoel's Studio Theatre on Monday 17 October 2017 at 19.00hrs. Artistic Director, Enrico Stinchelli, the Musical Director, Joseph Vella will be sharing their insights on the forthcoming production, the third AIDA Teatru Astra is staging. The workshop will be highlighting as well the experiences of a number of choristers who feature in the renowned Teatru Astra opera Chorus, led by Dr Maria Frendo. Enrico Stinchelli, an expert in the history of opera and vintage recordings will speak about Aida through the decades and will identify landmark interpretations that the audience could listen to. AIDA is part of the 15th edition of Festival Mediterranea, a unique endeavour and the only festival of its kind on the Maltese islands, combining high culture with the production of an Italian opera in conjunction with traditional fare. The website www.teatruastra.org.mt includes online booking facilities for the opera and carries all the latest updates on the opera and festival. The opera AIDA is supported by the Gozo Cultural Support Programme. Teatru Manoel has also a long tradition of staging operas albeit on a different scale to the Astra. Being a 1731 theatre with a stage that is merely 7 by 11 meters and an orchestra pit that is a miniscule 7 by three meters, the type of opera that is staged in this historical and artistic gem is radically different to the type of opera houses built in the Verdian tradition. In recent years the Manoel has presented Purcell's poignantly beautiful miniature opera Dido and Aeneas and Offenbach's Orpheus in the Underworld, both joint ventures between Valletta 2018 Foundation and the theatre involving Teatru Manoel Youth Opera. The last three major opera productions, which are usually presented in March, have been Mozart's 'Clemenza di Tito', Donizetti's 'L'Elisir d'Amore' and Gluck's, 'Orphee et Eurydice'. In March 2017 the Manoel will be staging Mozart's 'Le Nozze di Figaro'.